I have read that cookbooks and children’s books are keeping the entire publishing industry afloat. That may be hyperbole, but it’s certainly true at my house! As an avid baker, home cook, gardener, and canner, I sometimes read cookbooks cover to cover—in addition to watching cooking television. Like me, many of our patrons are hot on these same topics, and we all get excited when we see books by our favorite local chefs and Food Network personalities. Ree Drummond, the Pioneer Woman, is a powerhouse unto herself, as a popular blogger with a show on Food Network. Last year, her newest cookbook, Come and Get It!, was the #1 bestselling cookbook. Her 2015 book, The Pioneer Woman Cooks: Dinnertime, held steady at #6. Incidentally, she has also dipped into children’s books, with stories for early readers about her dog, Charlie the Ranch Dog, and a new picture book series about “Little Ree.” Her writing is homey, country fun for all ages and skill levels. British celebrity chefs Jamie Oliver and Nigella Lawson enjoy an influential presence in U.S. publishing. Jamie Oliver has been a regular on television and YouTube and is well-known for activism about healthy eating for children. He most recently published Jamie Oliver’s Christmas Cookbook, in 2017. Nigella Lawson is a favorite guest on talk shows and radio, with her unique style, self-deprecating humor, and gorgeous food. She is currently on a U.S. tour with her book At My Table, which published in April 2018. The other ubiquitous Food Network stars—Giana de Laurentiis, Bobby Flay, and Michael Symon—all have new books this spring. Which makes me wonder, How do these stars keep up with the work?! Bravo’s “Top Chef” has produced a long list of hot young chefs with new restaurants, James Beard awards, cookbooks, and fans. Hugely successful past Top Chefs Stephanie Izard, Richard Blais, and Fabio Viviali all have new books out this spring. Show hosts Hugh Acheson and Gail Simmons both released new volumes this past fall. None of these are first-time authors; note that readers and cooks demand more! I really love reading about how these chefs came to be so successful in a business that is brutally hard and becoming ever more competitive. Fortunately, many giants of American cuisine have written highly readable memoirs, such as Alice Waters, Marcus Samuelsson, and Ruth Reichl. Chef Jose Andres has a forthcoming memoir about his recent experience serving millions of meals to residents of Puerto Rico just after Hurricane Maria: We Fed an Island. He also gave a TED talk on this topic, which you can check out here, in advance of the book. What could be more inspiring? If you are interested in keeping up with cooking trends and new cookbook releases, the popular foodie website Eater does an excellent job of sharing news and reviews of cookbooks. As with all things books, Book Riot keeps up with cookbook trends and helpful topical cookbook lists. Their lists could help you create wonderful displays. And, just for fun, the New York Times spin-off, Food 52, hosts a cookbook bracket competition each spring to choose the best cookbook of the year. Reading about how they judge their competition is a fascinating way to consider cookbooks. 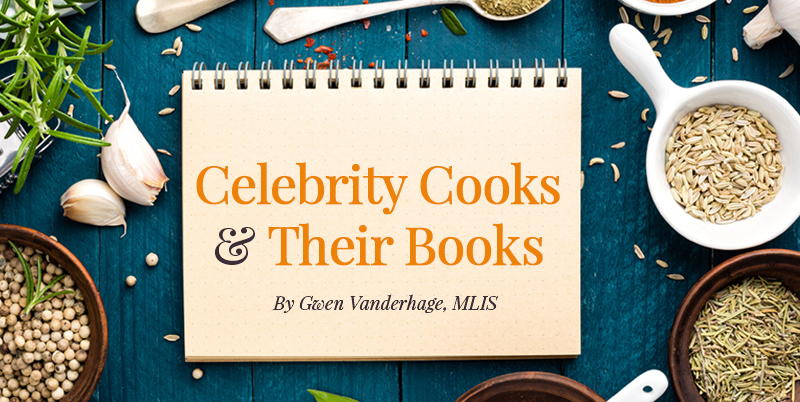 For a list of titles mentioned here and other recent titles by celebrity chefs, check out our Celebrity Cooks and Their Books title list in Bibz.